Your helmet will not only be customized. It will become an art work, and you’ll become an artist. Creations are the result of particular thoughts, exchange of ideas, researches and expression of an own artistic style. Helmets are considered as a whole to design an harmonious composition, and colors and materials are carefully chosen. Further, they are hand-painted with love and patience. It means that they are more than customized: they become a unique identity. The artistic process doesn’t end with the customization. Your helmet will evolve with you. You will take it for a ride, and it will metamorphose into a mobile art work. Shapes and colors will express themselves differently depending on your position, the angle and speed of your machine. Colors will appear more intensive or fade out because of sunlight or a raindrop. Fabrics will softly absorb the marks left by your leather jacket. Then, copper or gold leaves will take in secret your fingerprints. Without knowing it, you will become the artist and the helmet your creation. 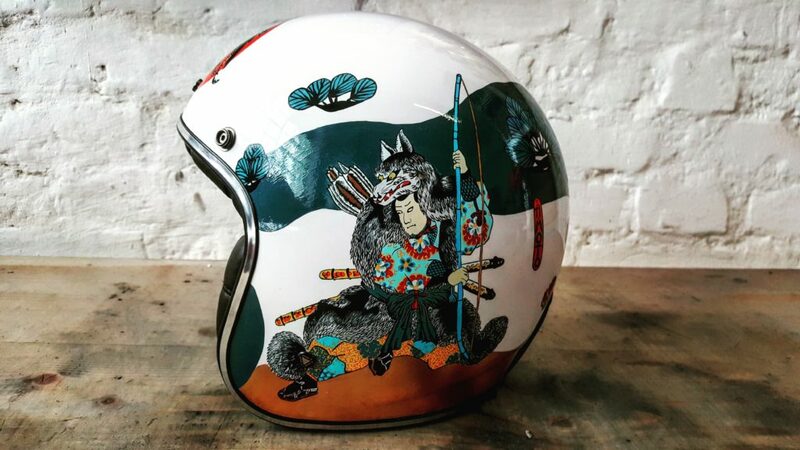 Helmkunst means “the art of helmet” in German. This art promotes the continual evolution and mobile expression of artistic creation and perception. On one side, when a rider in movement wears a painted helmet, the perception of the paint is unique at every moment, making it an infinitely dynamic and ephemeral art for the observers. On the other side, when going back home, the rider removes the helmet and the art work remains unchanged and singular. 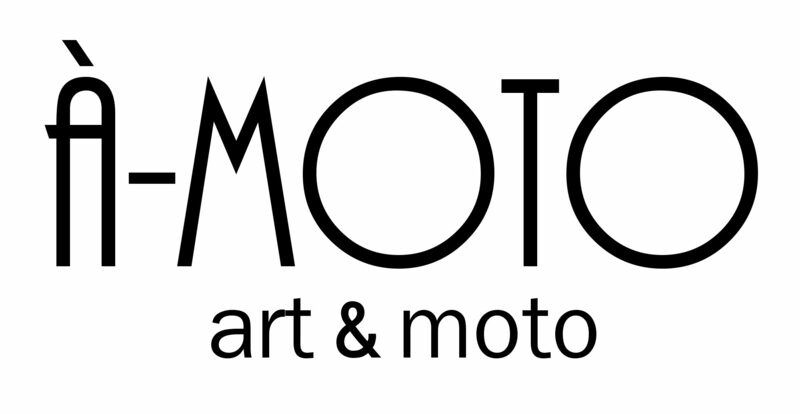 It means that the practice of motorcycle and use of the art work make it alive. 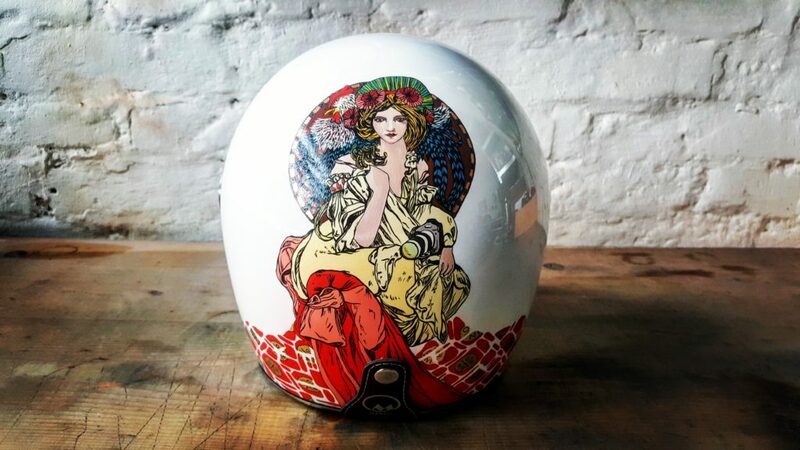 Discover the latest motorcycle helmet collections and click on your favorite helmet to discover more creations in that particular style. Stories about unique helmets and more photos are waiting for you. Do you want to customize your helmet? Check this post that will explain you how it works. 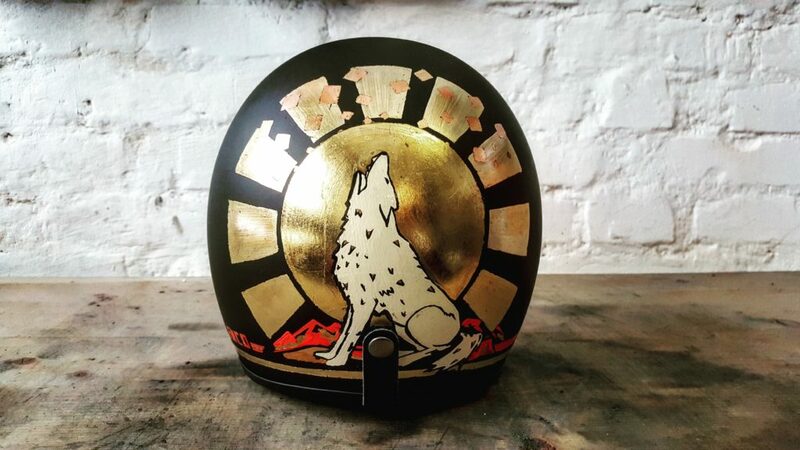 Do you have questions about the design and art painted on those motorcycle helmets? Just contact me! I am also happy to meet you if you are near Vienna or Paris. Inspired by the french Art nouveau, the Paris 1900 Exposition universelle, the Vienna Secession movement and following artists: Mucha, Klimt, Hoffman, Wagner and Moser. Inspired by Japanese art, symbols and key elements of the Japanese culture, the genre "Ukiyo-e" and the style of the artist Ito Jakuchu (1716-1800). 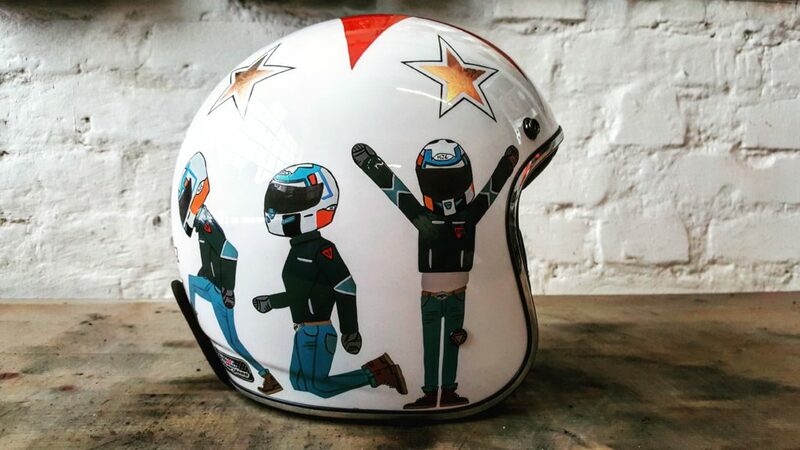 "La danse de la joie Helmet"
Inspired by flat and swiss design. Creation of simple and yet impactful visual effect through the harmonious composition of vibrant colors with a minimalist approach. Inspired by abstract art and following artists: Paul Klee, Wassily Kandinsky and later creations of Robert Delaunay. 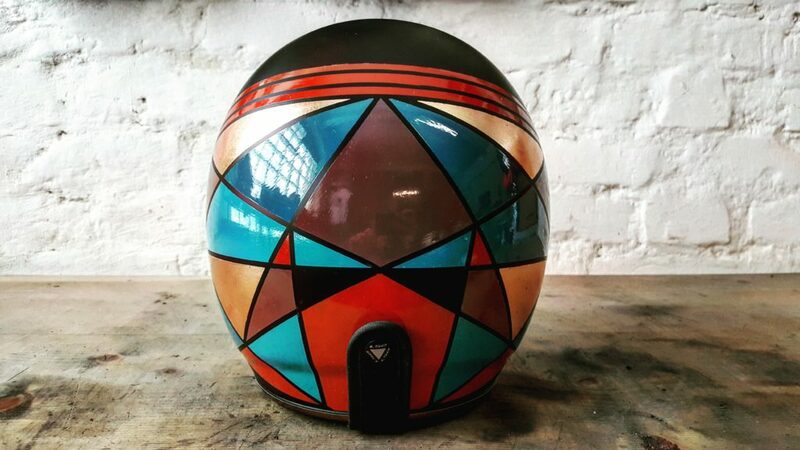 Helmets are seen as basic curved planes for experimentation and intuitive painting. Inspired by the pure mineral Copper. 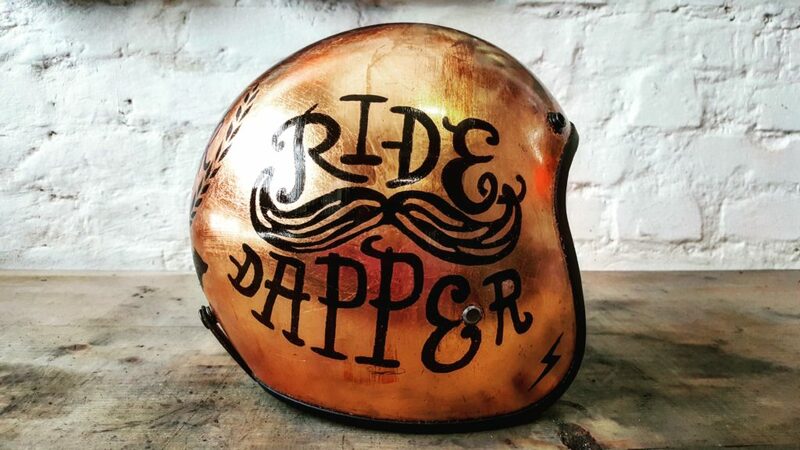 Helmets are entirely recovered with copper leaves and motives are carefully engraved in the material. Inspired by the world of wolf, using symbols and key elements of the wolves and their universe. A-moto is also about riding. Take a tour of my last motorcycle adventures across Europe!